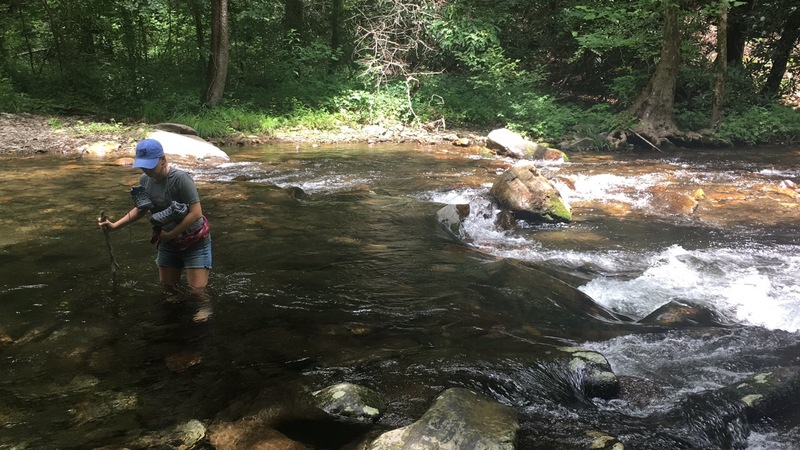 It's felt like way too long since we were enjoying the cooler weather of the North Carolina mountains, so I figured it was high-time I shared some of our favorite spots from our trip this past summer! It doesn't matter where we go, our wine loving hearts have one priority; find the nearby vineyards or wineries and hit up as many as possible! There are some awesome options in and around Cherokee County. Though it was hard to pick favorites I think I would have to say our favorite visit was to Calaboose Cellars. One, because the wine was great, but two, because it shares a location with Andrew's Brewing Co. He gets beer, I get wine and we are both happy, happy, happy!! It helps too that it shares the same "real" name as Babe! 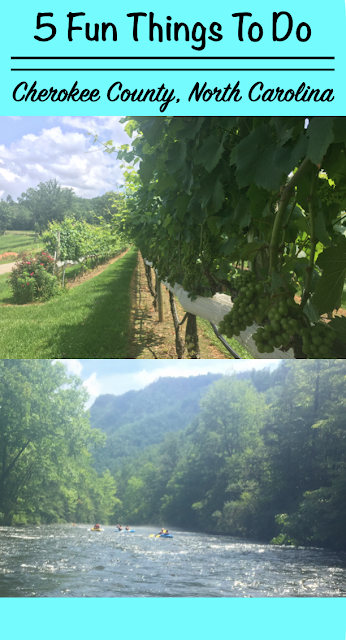 We also tried Valley River Vineyards (very "homegrown"), Nottely River Valley Vineyards (3rd fave; with beautiful views and a porch to sit at while you share a bottle), FernCrest Tasting Room (yum!! ), and Eagle Fork Vineyards (2nd fave; because of the stunning porch views and wine slushy amazingness). 2.) Grab a Beer and some AMAZING food!! Sadly, for him, Babe missed out on my favorite food find. The bestie and I hit up Hayesville Brewing Company, originally for a beer on the way to Eagle Fork Vineyards, and found that they had some of the absolute BEST food we had eaten the whole time we there. They make one killer grilled cheese!! Plus, they have markers and paper coasters to give you something fun to do while you chat over a beer and wait on your grub. The owner will tell you that, while they were originally intended for any kids that might come in with their parents, they have gone over way better with the adults!! The owners originally moved to the area to escape the Florida heat and try their hands at a brewery, while the wife uses her recipe-creating-skills to keep the menu fresh and fun. 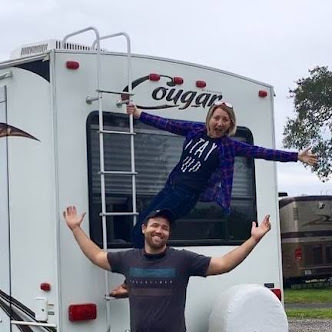 how people are living out their dreams! There are some stunning trails in North Carolina and Cherokee County has plenty to choose from! We really liked the Fire Creek Falls area. It was a huge area, with tons of trails. We also took a drive to the top and stumbled across a beautiful little spot for camping, if we ever make it back with the RV. When you are hiking in the summer be prepared for wet trails from afternoon rain storms. We actually didn't get too hike as far as we had planned, because the trail crossed the river so many times that we decided to turn back instead of taking our hiking boots on and off every time! Tip: Grab some Chacos! I actually had mine with me in NC, but decided to wear hiking boots since we weren't sure how rocky the trail would be. It is definitely more wet than rocky and you will be up to your mid thigh in some spots. We opted for a different trail, that looped past the waterfall, and had less standing water. 4.) Float the Day Away! We liked the Fire Creek Falls area so much, that I went back by myself one day. Babe had flown out early, while I stayed with my bestie. She had to work, but I was determined to make it back to do something that I had seen kids doing when we had gone on our hike... tubing!! 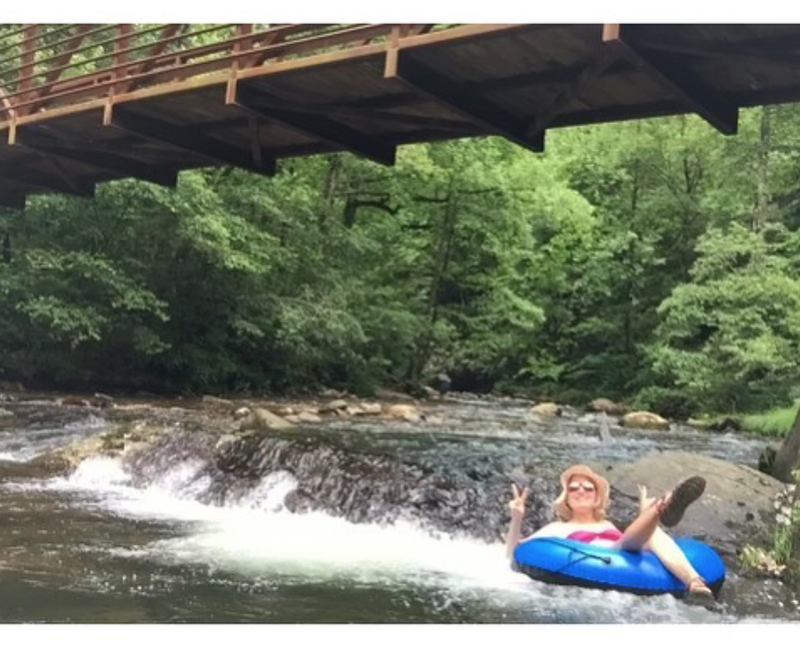 This is not a designated tubing run, but you can bring your own tube and float down the river for a bit, or just splash around in the deeper sections. There is a public picnic area and families will gather to spend the day in the sun and take a dip in the water. The river runs fast enough that there are some little "rapid" sections that add to the fun. You hike maybe a minute (across the bridge and past one of the picnic tables), put in your tube and then float for about two minutes, hop out and do it all over again. It was a blast!! Did I feel a little weird at first, being the only adult there without a kid and also one of the only adults tubing at all?! Maybe a bit, but I got over it pretty quick. I even befriended a little guy and his grandma (who had fallen in with her clothes on while trying to help him get started), so I had a tubing buddy for a minute while he learned the ropes. After that I floated, ate some lunch, and basked in the sun to my hearts content! You can also cross the river and go climb up part of the waterfall! Warning: Watch for snakes in the rocks. I didn't know they were there the whole day, but a guy pointed them out in the rock wall I was walking over to get back in the river. They are fine, just be careful where you place your feet and fingers. 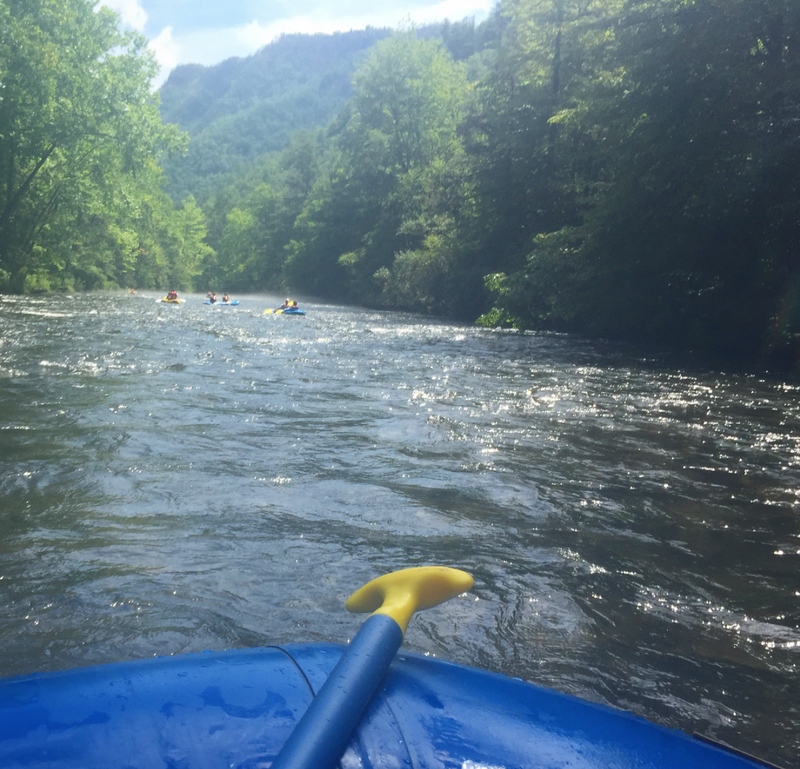 One of the funnest summer activities in North Carolina is white-water rafting! It just can't be beat! We took Sunday to load up and head out to the Nantahala. We hadn't known for sure which day we were going to end up rafting, so we didn't really plan ahead. We found the best deal through Carolina Outfitters and actually really enjoyed them. We opted for a 3 person, non-guided raft; we have all rafted before, but if you don't feel confident on your own you can always get a guided boat for just a little bit more $$. If you have time to plan ahead there are often great Groupon Deals. The Nantahala is the milder of the two rivers near Cherokee County. The Ocoee is also an option, if you are looking for an even bigger thrill, but that river has to be done with a guide and a helmet. We opted to go at our own pace, with the sun shining brightly on our heads!! Rafting Tip #1: Be prepared for the water to be cold!! Some people prefer to wear long pants and jackets, but honestly, I brave that initial tingly feeling and then you have the sun to warm you up. In my opinion, wearing long clothing just means more of your body will stay wet and the wet is chilly. As long as the sun is shining it will dry your skin right up (until the next big wave), whereas your clothing will stay wet longer. Rafting Tip #2: Eat a hearty breakfast/ snack! Depending on what time you choose to hit the river it is important that you have had something to eat. Rafting is strenuous and you are on the river for at least 2-3 hours; sometimes longer. I don't know about you, but I can get real hangry! Even though I hadn't eaten breakfast all that long before we went, I made sure to bring something with me to eat while we waited on the shuttle to take us to the drop in. If you wanted to you could also pack a little snack in your pocket or a wet-bag, just make sure it's individually wrapped! We also bring bottled water with us and eat/ drink during the lulls in rapids. There are spots you can pull off to the side, but depending on the trip outfitter it isn't always encouraged. there is something for everyone in Cherokee County! If you prefer something a bit quieter, most of the small towns have a little museum highlighting the history of the area. You can also simply stroll down the main streets and get a local feel for each place. The towns are quaint, the people kind, and there is usually at least one rocking chair to rest in somewhere. There is definitely no lack of things to do in Cherokee County, North Carolina. I would love to go back and hope you get the chance to visit someday too! 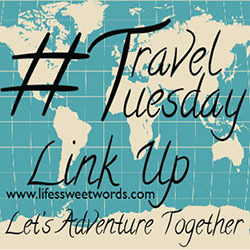 What is your favorite small town to visit?! this looks like a blast!! I love vineyard hopping, so now I wanna go haha! It really was a fun day! It's such a nice area, because you could actually combine both if you wanted! This looks so fun. My work brings me out to NC all the time. I'm going to have to check these things out the next time I'm there! Ahhh, fun! I would love to have a job that sent me to NC!! I would definitely love to go hiking in Cherokee County, Melanie! How many days are enough to stay there and explore the highlights? I would say you could do all the highlights in about 3 days, but I would recommend at least 4 or 5 to really allow yourself time to enjoy it and not feel rushed! Oh so many fun outdoor activities! i LOVE hiking so that would be my first choice. Agreed, I love how pretty much everything can be done outdoors! I've never been to this part of NC! We love OBX - but now I'm thinking I need to check out the mountains! And I've actually never been to the Outer Banks! I am itching to get there though. I'm sure most people want to go there in the summer, but I am actually hoping to visit in the fall (or maybe even winter) when the beach is less crowded and just find a blanket to cuddle with by a fire while I watch the water! I'd love to float on a river and just enjoy the sunshine!! And maybe do some slow rafting? Though, I'd be terrified of the snakes!! Haha, they can make me a little nervous too, but as long as you don't bother them they shouldn't bother you! I’ve spend a lot of time in SC and I can’t belive I’ve never made a trip to NC! Looks like it so much to do there and it looks so beautiful! My sister in law got engaged in Cherokee County so I actually heard about this place recently! Hopefully I can visit it one day! There is so much to do!! That's such a neat connection; you guys should definitely head back and plan a trip to reminisce and check out all there is to offer! So many! The perfect place for a morning hike and then an afternoon of sipping at the winery to treat all your hard work! Looks like so much fun! I only passed through North Carolina but it sure was pretty! You had me at vineyard hop! Gets me every time too! Haha, definitely can't go wrong for sure!! What are you using for a camera, Melanie? Your shoe? No, just kidding. Some of those shots look a little fuzzy or hazey, and given the beautiful scenery, you should give the lens a wipe something to do the countryside proper justice. Markers for the kids are a great idea, but if you ain't a kid, make some art! Haha, that's what I get for using the cheapo waterproof case from Walmart. I didn't have a GoPro yet, so I had my iPhone in a waterproof case to keep it protected, but still be able to grab some pictures! I have upgraded the gear though, because I noticed the exact same thing. So fun! North Carolina looks so lovely! I'm from the west coast and hope to visit NC someday!